Each time you travel on GO, your fare is deducted from your PRESTO card and you receive fare discounts based upon the number of trips you take within a calendar month. Learn more by calculating your fare. You save with PRESTO whether you take a single trip or commute the entire month. If you do not take the exact same trip each time you travel on GO within a calendar month, your first 35 rides on GO will be 11.15%** off the single-ride adult fare. For trips 36 and onwards, your discount will be based on the value of the trips you’ve taken that month. To receive a full-time student (ages 13+) or senior (ages 65+) discount with your PRESTO card, take your card to a GO Station Attendant or visit a Customer Service Outlet and have your card set to student or senior. Please note that it may take up to 24 hours for your card to be set to your discount status. Within 30 days of changing the setting, you must travel and tap on at a Fare Payment machine or a Balance Checker machine. If you do not take the exact same trip each time you travel on GO within a calendar month, your first 30 rides on GO will be 18.40%** off the single-ride adult fare. For trips 31 and onwards, your discount will be based on the value of the trips you’ve taken that calendar month. Children 12 years and under can ride for free on all GO trains and buses. 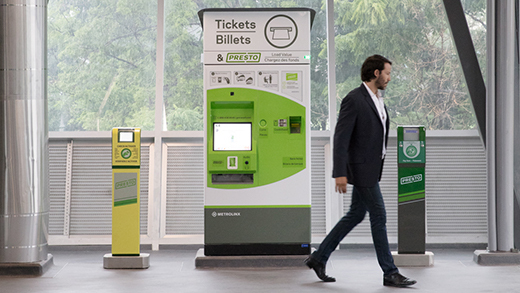 They do not need to use a PRESTO card or purchase a paper ticket to travel on GO Transit. If a child transfers to another transit service provider, PRESTO or cash fare may be required. If you do not take the exact same trip each time you travel on GO within a calendar month, your first 40 trips on GO will be 52.65%** off the single-ride adult fare. For trips 41 and onward, your discount will be based on the value of the trips you've taken that month. If your GO station's parking lot is crowded, you may want to consider taking local transit. Many transit systems offer discounts for GO customers. PRESTO automatically calculates your discount and applies it to your PRESTO account when you connect to/from GO Transit and your local transit service. As long as the transfer happens within 3 hours on GO and 2 hrs for a trip starting on TTC. Customers can travel seamlessly between GO, UP Express and TTC with their PRESTO cards, which will automatically charge only $1.50 for the TTC portion of the trip. That’s equivalent to half the price of an adult TTC fare paid with cash, tokens or PRESTO. For more information about discounts to local transit, click here. * Fares and discount are estimated and subject to change. ++ Discount is based on direct routes with no transfers, off a single adult GO fare. ** Actual discount may be .1% lower due to rounding. For more information about PRESTO Perks, click here.